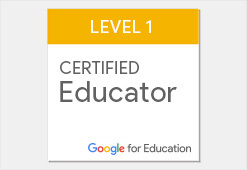 Google has recently revamped it’s education certifications. My last certification was fairly close to end-of-life, and I wanted to see if I should recommend this to others, so I decided to go through the training and take the test. I was pretty happy with the results. Like the old certifications, the real value was in the free training Google provides. This was all new, as well, and had really changed focus. Previously, the emphasis was on how to use the tools and it was a great tutorial for many of them. Now, the emphasis is on how to specifically use the tools for education, with the examples illustrating how a teacher might want to use the tools in daily practice. Although I had already been through the training, and it’s very easy to skip sections (there’s a link to jump straight to the quiz so you can check yourself), I still spent a significant amount of time on the tutorial. I managed to pick up some details I hadn’t known about some apps. More importantly, I saw some different ways these could be used in my workflow. While not everyone will use these tools in the same way, it was good to see some new possibilities. The test was also very different from previous versions. I used to be a bit of a certification junkie, and I do like tests. This was one of the best I’ve taken. Like all Google tests, you need to have a webcam. And the sign up is a little strange, since you sign up through a third party, who sends you a temporary email address for login. Once past all that, you start on a fairly long exam with a three hour time limit. I’m usually a very fast test taker, but I still required a full two hours for this one (although I did have to take a number of small breaks as people came into my office who needed my attention, so maybe an hour and a half of actual testing?). The first 20 questions or so were multiple choice and pretty straight forward. It would be possible to look these answers up on the fly, but only if you already had an inkling of where to look. The second part of the test was where it got interesting. There is a dummy Google domain set up, with a number of accounts, contacts, and a Drive folder full of goodies. For each section of the exam, a different app is emphasized. For example, one section centered around scheduling meetings with parents and a student, and another around creating a Google Site for your fictional class. In each case, you are required to perform a number of tasks in the actual account. This is by far the most realistic assessment I’ve taken to date, and would be a wonderful learning tool all by itself. I’m very curious how the scoring is done on this section, because many of the tasks would seem to require an actual human to score. Again, it would be possible to look up how to do many parts of this section. I do not believe that someone would have time to look everything up, though, as there are a LOT of tasks! I feel confident that anyone passing the test is a competent Google Apps user. After finishing the test, I was told that I passed almost immediately. This suggests that it’s machine-scored after all. I should be getting an email soon confirming this, and giving me access to the logo, etc. I would recommend this certification for teachers and administrators, and would like to see schools offering incentives of some sort for the training. Call me a font geek, but I find this fascinating! I love that the first world is a teaching tool, so that the player learns the game while playing, rather than during a tutorial. It’s easy to forget how much thought has to go into the design phase of a good game!